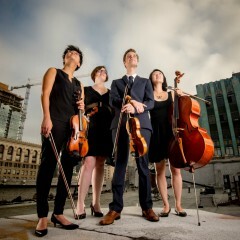 The Argus Quartet — which consists of current and former USC Thornton students Clara Kim (DMA, ’15), Jason Issokson (MM, ’10), and Diana Wade (GCRT, ’13) — was awarded a commission by Chamber Music America, a national network for ensemble musicians. Awarded as a part of the organization’s Classical Commissioning program, the grant provides support for American classical and world music ensembles for the creation and performance of new chamber works by American composers. For the commission, the quartet enlisted the work of USC Thornton Composition Department alumnus Eric Guinivan (MM ’08, DMA ’11). Guinivan’s piece, String Quartet No. 1, was recognized by Chamber Music America for its creativity. The Quartet, which also includes cellist Joann Whang, will premiere the work in the Netherlands at the Cello Biennale Amsterdam this October.